Ruth McCartney | All You Need Is News! Ruth McCartney, originally a British musician, and the stepsister of Paul McCartney, is now an internet, digital and new media entrepreneur holding the titles of CEO of McCartneyMultimedia.com, a creative digital agency; Co-Founder of fan management software company iFanz.com; and partner in her mother Dr. Angie’s company Mrs. McCartney’s Organic Teas. 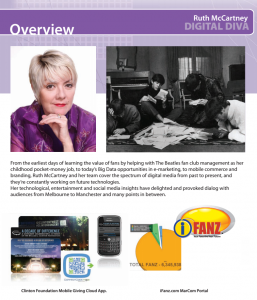 Join Ruth as she embarks on the journey of social media marketing from the early Beatles’ days to corporate decision making today. 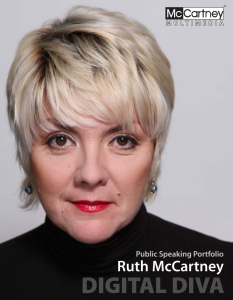 An internationally acclaimed public speaker, and former Russian pop-sensation, appearing from Sydney to Siberia, Ruth McCartney has seen and done it all. As an entrepreneur, Ruth started the Woman Minority Registered McCartney Multimedia, Inc. with her husband Martin Nethercutt and mother Dr. Angie McCartney, in 1995. After being focused in mainly the music and entertainment industries, Ruth started venturing into the online arena in 1996. Many online, mobile and digital adventures have followed, with clients ranging from Intel to John Cleese, and from The State of Nevada to Roseanne Barr. Developing and designing web sites and online campaigns for their clients at first, Ruth now focuses her attention on all the methods of online marketing and social media interaction with celebrities, products, corporations, educational institutions and brands. Topics range from social media to marketing, pop culture and PR and all things digital. From the earliest days of The Beatles fan club management, to e-marketing solutions, mobile donations and marketing campaigns, Ruth McCartney covers the spectrum of social media from past to present, and is constantly working on future technologies. A look back at formerly “cutting edge” marketing techniques, from the start of the Beatles Fan Club on the McCartney family’s Liverpool kitchen table, to the now of the mobile web, iTablets, individualized airline entertainment channels, and the future of envisioning where we can expect the industry to go in the next 20 years with Big Data, GPS tracking, demographic profiles, predictive purchasing and more. How social media, networks and opinions impact today’s world in all aspects of business, branding, reputation, product development, customer relationships and even damage control and liability. Without a clear strategy and policy in place, your organization could be at risk. Emperor’s New Clothes or a smart conversion / sales strategy? How you handle your social content can make all the difference in the world. Using ConnectCodeTM – QR Codes on steroids – how we can extend the life of media buys by: adding codes to TV Commercials, print and outdoor; deliver a mobile open-house experience; use QR2.0 to create a community and its dialog; increase non-profits’ revenues by facilitating spur of the moment donations; drive digital media sales and much, much more. If you don’t know your audience, you can’t possibly shape your message. How technology combined with strategy allows us to develop commerce into one-on-one relationships with consumers, study their geographical, social, brand-loyalty, political and personal views in both pro-active and passive forms, both online and in the mobile universe. Examining the detail behind the visual, pop culture, fashion and social influence introduced to the world by the Fab Four. The story behind album covers as diverse as Sgt. Pepper and The White Album. The movies, the fashions, the haircuts, the cars, the impact on the fashion and merchandising industries. Who were the behind-the-scenes teams that put the look together from Carnaby Street to Calcutta? A Magical History Tour of the sights rather than the sounds of the Lads from Liverpool. Marketing is no longer a local proposition since the inception of the Internet and mobile universe. Localization, understanding good and bad colours, user interfaces, traditions, superstitions and even why some Fortune 100 companies have failed in foreign markets through lack of “local hands” expertise are discussed. Stealth methods for women in business. Why you don’t have to play golf or play dumb to get ahead. Book the Digital Diva today for your event!